This weeks topic as chosen by you is "nature and our connection to the earth". Big thanks to everyone who took a moment to complete the survey! I don't think it is took crazy to think that since we (humans, plants, animals, organisms) all come from and are connected to earth that we cannot receive messages and guidance in the signs we see from nature. When we do notice particular things, simple acknowledgement can go a long way in deepening our connection and seeing more signs. I discuss and pose the questions: What signs do you commonly see in nature, and in what ways could you form a stronger connection with the earth around you? Something fascinating for your Friday. Perhaps you've seen recent news of a NASA probe tasked with investigating Saturn. It has been in the news because the mission has come to an end; a mission which concluded with the probe descending towards the surface of Saturn, burning up in the atmosphere. So much of this story completely blows my mind along with bringing up a question regarding what we know as nature. First some logistics to think about that are insane. The planning of logistics and technology behind the planning of a mission this long and complex seem like something out of a fantasy. 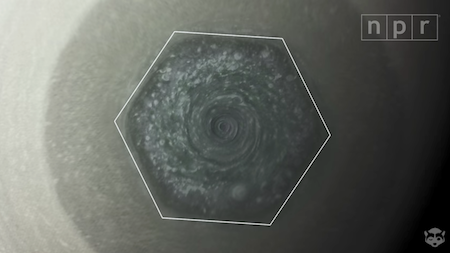 Saturn has a perpetual storm that takes the shape of a hexagon! This video from NPR is a great overview of the whole mission with some amazing imagery. The New York Times also has a great article with some fantastic photographs. Just where does "nature" begin and end? Is it only know of what we experience here on earth? Or does it extend out into the cosmos where we see solar flares and storms like this that take an actual shape? I am always open to changes in thought, but things like the moon, solar flares, and the rotation of other planets do affect us, so at this point I do storms taking place on Saturn as "nature". In what way does this affect us a billion miles away? I'm not sure but I do believe in the possibility that this is all connected. I mean, a permanent hexagon storm? Wow, just wow. One of my biggest areas of interest in relationship to our experiences is nature. We receive so much from the earth and there are so many messages to be uncovered. Tonight I'm talking about the mathematical perfection that can be found in nature and how this can relate to difficult times all of us experience. Take a look at the video for my thoughts and read below for more details. The Fibonacci Sequence, also referred to as "the golden ratio" is a mathematical sequence created (or perhaps discovered?) in the 12th century by an Italian mathematician who was not actually named "Fibonacci", which is interesting. I will spare you any attempts to explain the specifics around the sequence. If you'd like some history on the man you can check this link which was comprehensive and if you'd like the most basic explanation of the sequence I recommend this page. And this is what I talk about in the video in terms of mathematic perfection in nature. This pattern is seen so much in nature, from flower petails, to shells, to tree branches, to vegetables, and even in the human body. Just take a look at a google image search for the fibonacci sequence and you'll see what I mean. This is important to me because I see nature on a whole as a wild, often chaotic, constant explosion of life, death, destruction, and creation. Volcanoes, tornados, the ocean; things that we have no control over come to mind. Yet within all that chaos we have this beautiful, near perfect sequence which can be seen in many places if we look close enough. Mathematic perfection found within all that chaos. In my opinion this can be compared to situations that come up in our daily lives; things and places where we struggle. While it is not always the easiest thing to find, there is a lesson to be discovered in every situation. There is some small piece of perfection to be found within a dark moment. Something that can help us grow or help others who might be going through something we've already encountered. It isn't always easy, but simply asking "what is the lesson here?" and being open to any answer that comes is a great way to invite learning and growth into and situation. It may not come right away but you would be surprised at what the universe delivers when you simply ask. Perhaps you could find your own personal Fibonacci sequence the next time you are open to, and ask for growth. For one final great read on the fibonacci sequence I recommend this iO9 article which has some excellent explanations and visual examples.